This week, Kim Jones earned distinction in The Business Journals’ Influencers: Law, which spotlights 100 executives who are having an impact on business and legal matters in communities nationwide. Jones serves as Managing Member for Seyferth Blumenthal & Harris LLC (SBH). This year’s The Business Journals’ Influencers: Law includes representatives from both large national firms and smaller local firms. Jones was one of three individuals chosen from Kansas City. Editors and staff from The Business Journals’ network of more than 40 publications, including the Kansas City Business Journal, chose the honorees. All have been featured as part of the publications’ Newsmakers feature in their local cities. An accomplished trial lawyer in a career now spanning more than two decades, Jones became Managing Member of SBH in 2016, and she was profiled for her role at the firm in a November 2017 article in the Kansas City Business Journal. 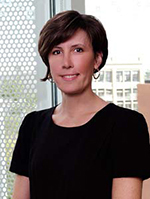 She focuses her practice on labor and employment law representing companies, not-for-profits, and higher education institutions in federal and state courts and before AAA and labor arbitration panels. Jones also provides discrimination consultations and counseling to clients on labor and employment issues, including harassment, effective supervision and managing the absent employee.